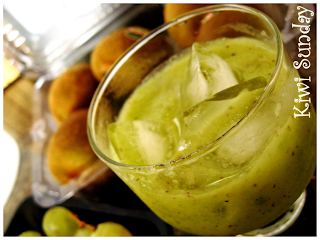 Process or blend the kiwi fruit and apple, then the grapes. Pour into glasses and serve just as it is, or pour over ice. P/S: Plus green fruits are rich in fiber, folic acid, lutein, beta-carotene, and vitamin C. It helps protect you from cancer and high level of bad cholesterol, regulate digestion and improve immune system functioning. no lao sai? so much fiber wor..
no lao sai..u think 1 shot drink 1 litre meh..
hehe ya, in smoothies-craze phase rite now i guess..